Experience the Real Costa Rica in a High-End Rural Lodge. 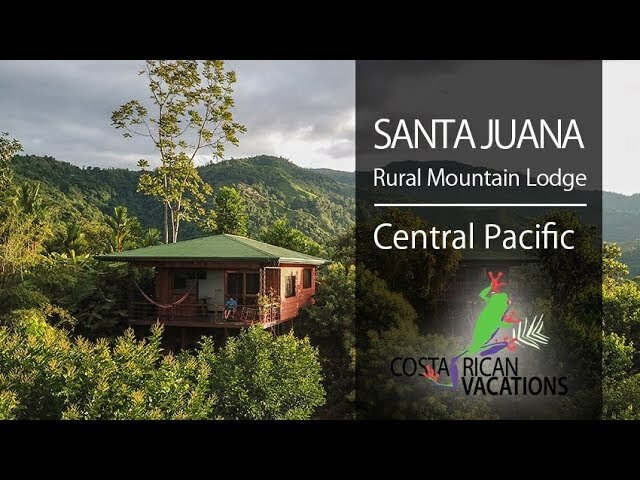 Santa Juana Lodge gives its guests a special, rural experience unlike what most visitors have ever had the chance to experience. This retreat, set along a ridge with remarkable views of the forest, offers a variety of rustic yet comfortable accommodations, all inspired in the traditions and architecture of Costa Rica. The enviable location allows for views of not only the forest, but also the Pacific Ocean in the distance. Mountain air and soft breezes await you from the porch of your freestanding cabin. One of the biggest draws of the property is the variety of tours (additional cost) that are accessible on-site, meaning that guests don’t have to use their precious time traveling but rather can truly relax. Options include zip lining canopy tours, birdwatching, waterfall swimming, and hiking. Your stay also includes meals from the El Mirador restaurant, featuring authentic Costa Rican recipes and a selection of traditional non-alcoholic juices. The restaurant itself has a charming rustic design and is set on a lookout point with amazing views. There is nothing like a Costa Rican coffee while resting in one of the many lounge chairs or the hammock! Not able to fit Santa Juana into your lodging plans? You can always book a Santa Juana Cultural Experience tour! Meals from the El Mirador restaurant and a selection of traditional non-alcoholic juices.